Welcome to the Woodburn Endoscopy Center website. The Center is a state of the art free standing Endoscopy center that opened in June 2007. We are located in Annandale, Virginia. 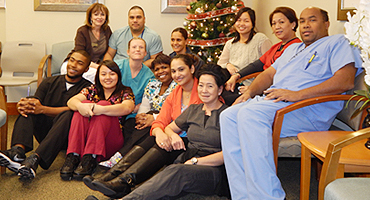 Our physicians and staff are dedicated to providing the highest level of services. There are 10 Board Certified Gastroenterologists at WEC. The facility has met all accreditation requirements for AAAHC (Accreditation Association for Ambulatory Health Care, Inc.). This organization was formed in 1979 to assist ambulatory health care organizations maintain the highest level of care provided to patients. The Endoscopy Center undergoes a rigorous re-credentialing process regularly. The Center has 3 fully equipped procedure suites for upper endoscopies and colonoscopies, 10 pre-op/post-op areas that are designed for patient comfort and privacy and a staff that always puts the patient first. We have found through patient surveys that our facility is the "preferred" facility for having a colonoscopy or upper endoscopy and our staff are very highly rated by our patients. Along with our Gastroenterologists, the Center is staffed with a team of anesthesiologists and highly qualified nursing and technician staff. Our administrative staff are friendly and caring and will assist you in any way. All of our staff have been in the medical field for many years and understand the anxiety that some patients experience with this type of procedure. Our staff will put your mind at ease. If you have any specific concerns, please feel free to talk with our nursing staff.